Named after a Postal Services song. I loves me some Fallout 3. Have sunk many many hours in the franchise, and wanted to give props. This, like the Bioshock piece and the Rock Band piece, has been autographed by dev team members. 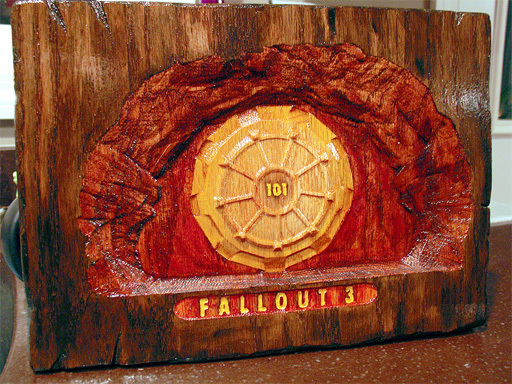 I thought about (and still might) carve out a 2-sided model of the vault door, perhaps to have cast in metal of some sort, but I don't know if I care enough to blow that much money on fan-art. =) Board is approx. 12" wide, 7" tall.